The study by the Development and Research Center of the State Council of PRC: On China’s Mid-to-Long Term Debt Capacity and Systematic Risks researches the future debt capacity of China’s central government and systematic risks the central government will be faced with in terms of possible changes of its financial revenue and expenditure at the stage of declining growth rate. According to the relevant studies, China’s current debt asset ratio still keeps pace with the international average level and the proportion of governmental debt in GDP is quite low even though implicit liabilities are involved and the governmental asset is measured on a narrow scale, thereby making risks controllable. However, the declining economic growth rate will lead to the growth rate of financial expenditure exceeding that of the revenue and make China’s deficit ratio improve prominently. It is projected that the deficit ratio will approach the international alert level by 2018. Therefore, maintaining the sustainable growth of the economy and the stability of financial policies are the fundamental approaches for China to defuse future sovereign debt risks. This book includes eight chapters. Chapter 1 is a study of the relation between the growth of China’s financial revenue and economic growth since 2003. Chapter 2 states that China’s economy has entered a key phase of growth mode transformation. Chapter 3 is about the prospects and measurements of the changes of China’s future financial revenue. Chapter 4 is about the evolution rules of governmental public expenditure in different phases of social development and the enlightenment brought out on China. Chapter 5 is a study of the balance sheets of the Chinese government. Chapter 6 is about the indications brought by the debt crisis of other countries in the world to China. 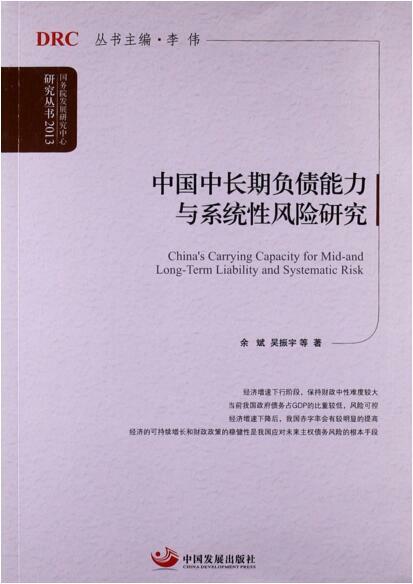 Chapter 7 and Chapter 8 provide an analysis of the sustainability of Chinese government’s debt and policy options.